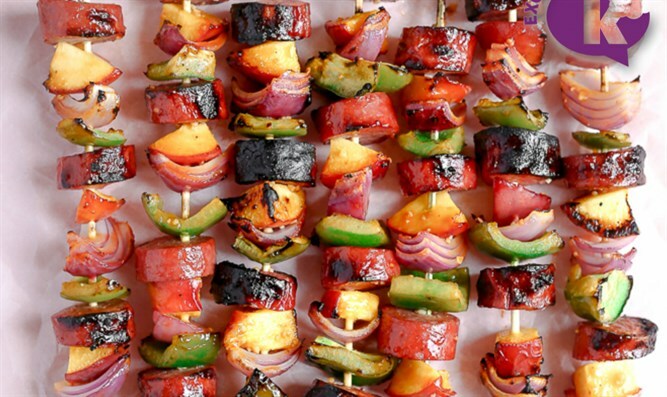 Throw these easy and flavorful kebabs onto the grill and please your whole crowd this summer. To assemble the kebabs, start off with a slice of the kielbasa and place on the skewer leaving about 1 ½ inches off the bottom. Continue with a chunk each of the onion, peach, and pepper, and continuing the pattern with the kielbasa. Continue on all skewers. In a small container, combine the barbecue sauce ingredients and shake to combine well. Brush the sauce all over the kebabs, making sure to get all sides. Grill for four to five minutes on one side, flip and grill for another four to five minutes on the other. Enjoy!